Automatic Doors , United Arab Emirates, then you are in the right place.We provide high quality products and maintain a good quality and a relationship with customers. And we are not any compromise to the.quality of a product. We supply all our products at affordable prices. All our products are durable with guaranty. Here you will always find the best products. And you will receive a 100% satisfaction guarantee only on bifold.ae or autodoros.ae. We offer a variety of colors to choose from. And our products are very durable and easy to clean. We also offer personalized services. We serve you door-to-door services for free. And our members will lead you to choose the best for the inner theme. We also offer demonstration systems without commitment. Manual revolving doors are as prestigious as they are elegant. Where buildings denote grandeur, revolving doors stand for style. As they combat heat loss in winter and heat gain in summer, revolving doors are particularly suitable in areas of high traffic densities and where energy efficiency is valued. Telescopic sliding doors offer a great benefit when space is limited. By incorporating an additional sliding door active leaf, a telescopic sliding door allows you to gain additional clear opening particularly welcome in the tightest of spaces. This is a perfect choice in large areas like meeting rooms and offices. This solution gives the maximum opening and light for the shortest wall space. This aluminum-framed trellis system with integrated water drainage is pitched from an existing structure and If you already have a pergola or trellis, the retractable fabric roof with aluminum guardrail system can be attached to your structure. The unique cantilever design with a durable aluminum frame allows installations without the use of posts and provides great coverage. Automatic Sliding Door is a high-performance entrance system that’s the perfect solution to complement any entrance, which offers a variety of options and is equipped with sensor systems that comply with the standard to promote reduced liability and increased safety. It is the ideal solution for almost all standard slide door applications. 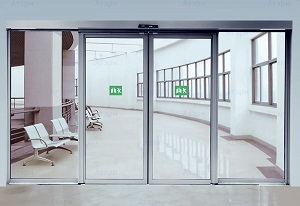 High speed doors are used inside and outside optimize the flow of traffic, improve room conditions and save energy. With the ability to close your door rapidly, you can minimize the temperature fluctuations which inevitably result from having an open gap between one area and another – this is true whether you want to keep the area in question cold or warm. uphill or wherever the space inside the property is not sufficient to enable the opening of swing gates. They are equipped with sensitive edges for maximum safety during the closing phase: the anti-crushing/obstacle detection function stops and reverses the movement of the gate in case its movement is blocked, thus avoiding damage to people and objects. Call us on 0555977438 and our leaders and experts will present the samples without purchase constraints. send us email inquiry info@autodoors.ae, info@aadcotopp.com. If you have a custom request and want to request a free quote. Call now for the best discount deals only on our website.